Last week we presented a review of SimPā at NACCQ. We we thrilled to be given the Award for Educational Innovation. Here’s the presentation and the paper itself. The SimPā project is a multiyear collaborative project that aimed to convey and strengthen Māori culture, tikaka and knowledge using innovative and cutting edge technology. In short, the project aimed to provide a means of telling Māori stories in 3D game format. This paper provides a review of the project. This development will have benefits in terms of both technology and culture and the fusion of these two: Iwi digital content. The project has achieved this through active engagement and participation. This paper is an initial review of the recently completed SimPā project. SimPā, first described by Mann and Russell et al. (2006) was a collaborative partnership between the Otago Polytechnic and Kā Papatipu Rūnaka o te tai o Araiteuru. The project aimed to convey and strengthen research aspects in regard to Māori culture, tikaka and knowledge using innovative and cutting edge technology. The funded project was completed in May 2009. The contribution of this paper is to provide an overview of the project from two perspectives – that at the start and end of the project. Visual representations are used to provide structure for this analysis. The text here is summarised from previous papers (Mann and Russell 2006). Although edited for space, the substance remains the same. SimPā is a large scale initiative: Māori Game Design, or Mātauraka ā whenua, ā moana, ā tākata ki te rorohiko. The project aims to convey and strengthen Māori culture, tikaka and knowledge by initiating a process of participatory Māori digital media design using 3D game technology. The project recognises that Māori culture is a vital part of what distinguishes New Zealand from the rest of the world. It is intended that the project will assist in the creation of 3D game-based Māori digital content so that distinctly Māori voices, stories and cultural content can be encouraged and promoted. Note: SimPā is shorthand for the whole project; GamePā refers to the developed game for each individual rūnaka. There are three major justifications for this project. 1. The risk of Māori knowledge being lost due to the reduction of hapū knowledge repositories. 2. The well publicised negative statistics of educational outcomes for Māori. 3. Consequent to (2), lack of skilled practitioners of Māori digital content. • Give local rūnaka a unique narrative tool (one that appeals particularly to younger generations). • Provide a virtual meeting place for whānau spread nationally and internationally in which they can interact in their own landscape. • The project will involve generations of Māori in gathering information and stories, encourage the preservation and creation of local Māori stories, increase the attractiveness of history to younger audiences and make Māori culture, mita (dialect) and tikaka accessible throughout the world. Figure 1 provides an overview of the SimPā process. A key component of the project will be a series of marae-based wānaka. Each wānaka will be kaupapa Māori and participants will be immersed in tikaka Māori. Participants will learn about the traditions, environment, people and history of that place from local Rūnaka elders who are experts in Māori oral history and local knowledge. 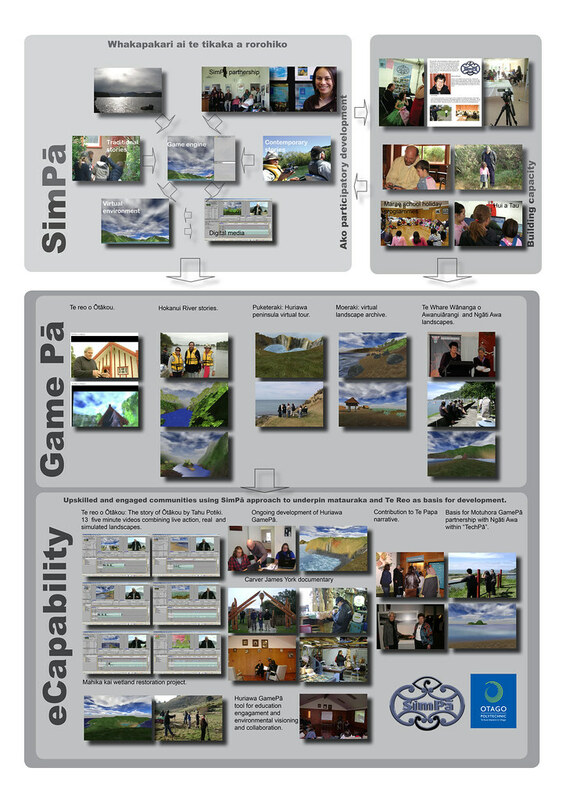 Using the “SimPā Toolkit”, participants will work alongside the Rūnaka members and supervisors to create a “GamePā” (a virtual environment representing a place). Based on the knowledge of Rūnaka members, participants will define the landscape, environment, and features of cultural significance, such as food gathering sites. Figure 1: Wānaka process of participatory game design. It brings together people from within the Papatipu Rūnaka who will jointly learn about their own place and stories, and convert this knowledge to digital form. Objective 3. Develop and test tools for the use of games in teaching Māori concepts. This encompasses specific research on the effectiveness of digital game based learning in a Māori context – use of the GamePā (Figure 1 middle). Objective 4. Develop techniques and practices for the further use of GamePā (Figure 1 lower). The resulting games will provide an interactive learning environment for use within each Papatipu Rūnaka. It is expected that this will enhance their mātauranga Māori, enable individuals to connect and have respect for their landscape and historical stories. Each game will be the intellectual property of each Papatipu Rūnaka and provide an indigenous tool for future development in education and Māori business. We believe that this integrated model – using a resource that is interactive, online and multiplayer – will provide measurable benefits for individuals, whanau, hapū and Iwi. We are developing a programme aimed at capacity building within indigenous people. By combining cultural knowledge with skills required for developing digital game based learning resources, we hope to initiate a pathway to encourage careers in this area. This will provide career opportunities in education, information technology and business (Figure 1 right). This collaboration is not just between a single group of stakeholders, but involves complex structures of knowledge ownership. An important part of this initiative is the development of processes maintaining the integrity of specialist knowledge and tikanga (Figure 1 lower). The SimPā project was funded in 2006 by the Digital Strategy through the Department of Internal Affairs. The project was completed in May 2009. Figure 2 provides an overview of the process from a 2009 perspective. Objective 1: Participatory approach to game development (Figure 2 top). The objective of bringing people from within the Papatipu Rūnaka who will jointly learn about their own place and stories, and convert this knowledge to digital form has been achieved. All Rūnaka engaged in the process of developing digital Māori content through a series of wānaka. The linear flow of the SimPā development represented in Figure 1 has been very much more organic in practice. The recreation of the landscapes (the first stage on the original process) had a fundamental impact on the Rūnaka. Without exception, the engagement at that stage was sufficient that further development (of the game environment) was unnecessary. No groups developed characters with scripted behaviour, in all; the landscape is the foundation of the story. The Rūnaka have had some extremely interesting debates about digital representation of images. For landscapes the debates are sometimes pragmatic – how to represent an area one group insists was always grassland whereas other families remember playing in the forest that once stood there. For people and stories, we need to recognise that there is rarely an objective truth. As the stories become older, the representation of a single image in a digital setting becomes problematic – just what did this ancestor look like? In part this was avoided by not having direct characters, but also by recognising that this is “our” version of the story, it is quite acceptable for you to tell another version. The software and equipment participants were educated in was Adobe Premier Pro, Adobe Photoshop, Torque engine gaming software, digital equipment handicams, still cameras and data management of such equipment. However we found that for most people the prior skill level and time needed to master the Torque software was too great for the time we had to work with them, also participants wanted to see quick results so we ended up having to hire a computer programmer to help Rūnaka complete the work that required use of the Torque software. The “SimPā toolkit” was created. This includes a suite of software packages and game templates. At the end of the project, however, the “toolkit” is more about a process of engagement. The SimPā toolkit has been much more about process – partnerships of ideas and capabilities – than about the technology. The Rūnaka all decided to work individually and nominated representatives to lead their respective projects. This aligned with the scope that the Rūnaka members would define what information was important to them and how their resources would be produced. All Rūnaka representatives communicated with their members to keep them informed on the project and had the ambition of producing resources that would be beneficial for all members. While the project was explicitly funded on the promise of game-based narratives, the Team spent a very great deal of time engaged in wider knowledge – and wider applications of digital technology. For, example, one Rūnaka has had a long held special role as archivists for the Iwi. They saw the potential for SimPā to help with this role. Before the Team could sensibly talk game environments, they spent time helping the Rūnaka with editing and sustaining existing media. Integral to the process was developing an Intellectual Policy that ensured the Rūnaka owned the rights to all their knowledge and narratives including the complete GamePā. Objective 3. Use of GamePā in teaching Māori concepts (Figure 2 middle). The uniqueness and process of the project saw the Rūnaka produce specifically tailored resources. In the original funding application the GamePā were described using deliberately ambiguous terms. This was to allow each Rūnaka to tell their own stories. However, we did expect the project to focus on the original GamePā and that these would be “games”. We anticipated these GamePā to be developed as robust products (along the lines of a packaged game). We also thought further benefits would come from the use of the GamePā in marae-based teaching etc. None of the GamePā would be considered “games” yet these benefits did occur with most of the Rūnaka actively using their GamePā for “virtual tours”. What we did not expect was the form of the GamePā to vary so much. Resources were produced such as complex narratives that use the game environment as “film sets” and virtual landscapes combining the game environment with other digital media – primarily audio and video. While the stories are hosted in the game environment, this was used as a platform for further engagement such as the recording and production of documentary style interviews that share stories of the past and present. None of the five Rūnaka GamePā could be considered “games” although all have made extensive use of the 3D gaming environment. These resources give access to the matauraka that they convey as well as the knowledge used to create them. They also provide a means of access for members regardless of their location in the world. In addition to surprise at the form of the GamePā, we also did not expect the Rūnaka to move so quickly to using the skills learnt through the SimPā developments to develop further applications (Figure 2 lower). The measures of success can be viewed not only by the physical outcomes and ongoing use and production of further resources, but by the actual process of engagement and dialogical exchange itself. The best thing to come from the SimPā project is the initiatives beyond the original GamePā. This demonstrates a very successful community adoption of digital media. These initiatives have included both game environment form and video form of GamePā, but put to quite unexpected uses. The subject matter has extended beyond the traditional stories to include contemporary narratives: the story of Puketaraki’s new carvings, and Moeraki’s expedition to Te Papa. The relationship between SimPā and landscape was further explored by the Ōtākou rūnaka who used it in visioning wetland restoration to reform mahika kai. One of the final phases of the project is the ‘handing over of both raw data and finished products’ before we evaluate and write conclusion papers. There has been surprise shown nationally and internationally (Russell and Mann 2007) that we were leaving the stories with the respective Papatipu Rūnaka. The assumption is that a project such as ours results in a contribution to a central archive. We have taken a very different approach: we have helped the Rūnaka retell their stories to themselves. In their new form they are still knowledge transmitted and retained within each Rūnaka. We had intended developing a specialist programme of learning aimed at capacity building within indigenous people. A Iwi Digital Practice Diploma programme was developed and approved but did not run. We believe, however, that a new subject area is emerging. This is apparent in the involvement of Rūnaka members in wānaka, and in the learnings of the SimPā team itself (Figure 2 right). To ensure access to information specific to the creation and production of resources a wānaka was held for all Rūnaka members. As expected (based on prior research) the attendees were teenagers and very enthusiastic about information technology. Parents and supporters viewed this wānaka as an opportunity for the rakatahi to learn and develop skills that can ensure the continuation and further development of such resources. Some of the Rūnaka are actively using SimPā to connect with their youth. Other training and wānaka that were held also provided opportunities for participants to develop their ecapability. The partnership has evolved significantly. The most important change was a realisation that to achieve the outcomes the SimPā team had to be indistinguishably both Otago Polytechnic and Iwi. The most successful capacity building has been of this evolving team. We see this as a very positive outcome. The project has taken far more partnership negotiation than we ever imagined. This has been constant and evolving. We believe that this model of engagement could be the model for further partnership. This collaboration is not just between a single group of stakeholders, but involves complex structures of knowledge ownership. An important part of this initiative is the development of processes maintaining the integrity of specialist knowledge and tikanga. (Figure 2 lower right). Otago Polytechnic has also developed a proposal to use GamePā to connect Māori living overseas back to their Rūnaka that they are currently seeking funding to develop further. This project will use virtual realities of people and places of tūpuna acting and interacting in these virtually created spaces. Kai Tahu people far from home can access these histories and te reo of their places; of ancestors and their deeds; of how to give this new knowledge to their children, many of whom have never set foot on these landscapes. Rūnaka are currently in discussion with the Ministry of Agriculture and Fisheries and local Rūnaka about using the GamePā format to create an interpretative resource for Mahika Kai. Further collaboration between Otago Polytechnic and the eWānanga Centre for Creative Teaching and Learning Te Whare Wānanga o Awanuiārangi is also in the pipeline. “SimPā” aims to integrate participatory digital interactive storytelling with Māori culture, tikaka and knowledge. The SimPā project uses gaming software to create various ‘GamePā’, which are virtual environments based on actual places. These environments incorporate the knowledge of Rūnaka members, recreating sites of cultural significance and historical environmental features that have since changed with the passing of time. The outcomes of this project were the completion of GamePā and narrative films incorporating digital content with Te Rūnaka o Ōtākou, Kati Huirapa ki Puketeraki, Te Runanga o Moeraki, Hokonui Rūnaka and Ngāti Awa. Topics included migration stories, the virtual recreation of a wetlands restoration project and local oral histories. Looking back, SimPā is quite different to how the team first conceived it. Despite these differences, or perhaps because of them, the project has met their expectations. One of the main lessons learned from this project is the need to abandon a linear flow to accommodate a process that is very much more organic. At the start of the project the team proposed a process of participatory development for each Rūnaka. For each group they saw a process of helping the community identify important stories and then converting these stories to a game-based environment. Of primary importance to the original project was the “SimPā toolkit”. However the SimPā toolkit has ended up being much more about process – partnerships of ideas and capabilities – than about the technology. In addition the development of each GamePā has been quite different to what we expected. None of the five Rūnaka GamePā could be considered “games”. All though have made extensive use of the 3D gaming environment. It was hoped that the resultant GamePā would be used in engaging and educating the community. The original goal for “Sustained interactivity” would be the use of these GamePā with Rūnaka’s work with schools and possibly in tourism ventures etc. The intended target for the project “teenagers dis-engaged from both their culture and education” proved hard to hit. However the team had most success with people in with young families (widely recognised as crucial for cultural development), the very young, and the more mature. Some of the Rūnaka, though, are actively using SimPā to connect with their youth. However the use of SimPā as recruitment tool for students into computing did not occur. While the Team believe there is still a role for the “Māori digital education specialist” it is difficult to see a predictable career path into this. The project has taken far more partnership negotiation than the team ever imagined. This has been constant and evolving and is a model of engagement for further partnership. The most important change was a realisation that to achieve the outcomes the SimPā team had to be indistinguishably both Otago Polytechnic and Iwi. The most successful capacity building has been of this evolving team. The team sees this as a very positive outcome. Because of the partnership approach SimPā has evolved dramatically since its conception. Rūnaka determined that the landscapes should become a major focus; the participants were so excited by the process of re-imagining and re-building the landscapes that the notion of the game format became less important. What is happening now is that they are using these elaborate 3D environments as film sets, as a way to tell narrative stories. Each group has decided on a different approach using their GamePā to record a range of traditional knowledge e.g. telling migration histories, recording their oral histories, describing cultural, traditional and botanical education; kai Māori and karakia and tikaka and for memorial purposes. This has required the project team to be adaptable and resourceful to adapt the original idea to fit the needs of the communities. This has been essential for the project’s success. The team have also needed to adapt their approach to work not just with Rūnaka but also with different whanau groups within the Rūnaka. The future usefulness and sustainability of the SimPā process is assured through the new projects both the Polytechnic and Rūnaka are currently pursuing. It is evident that there is a need to develop and offer different models of teaching and learning. Models that vary in content, specifically iwi digital content, and structure. A flexible structure and delivery that will be beneficial for community users. eg: wānaka, marae based teaching, flexible hours, units etc. SimPā was funded bty the New Zealand Government’s Digital Strategy, through the Department of Internal Affairs. This collaborative project is developed as a result of the Memorandum of Understanding between Otago Polytechnic and these Rūnaka. This MOU is instantiated in the position of the Kaitohutohu and the Kōmiti Kāwanataka. The SimPā team has immensely enjoyed working with the following individual Rūnaka, and the committee of the combined Rūnaka of Arai te Uru. We would also especially like to acknowledge Kelly Davis from one of the key partners Te Matauranga Putaiao Trust who died suddenly as the project got underway. Kelly was a key figure in the project and is sadly missed. Te Rūnanga o Nagāi Tahu head office has also been very helpful in the SimPā project. We are grateful for the assistance of (then CEO) Tahu Potiki and especially the GIS expertise of Jeremy King. We have also enjoyed working with Ngāti Awa, facilitated through Te Whare Wānanga o Awanuiārangi. The SimPā team has evolved over time. The authors are grateful for the support of Paul Admiraal, Jenny Aimers, Leigh Blackall, Amber Bridgeman, Justine Camp, Sunshine Connelly, Mark Crook, Rachel Dibble, Dougie Ditford, Evelyn Davis, Gwyn John, Marlene McDonald, Karen Love, Alistair Regan, Thomi Richards Lesley Smith, Dana Te Kanawa, Andy Williamson, Jeanette Wikiaira, Vicky Wilson and members of the Kōmiti Kāwanataka.